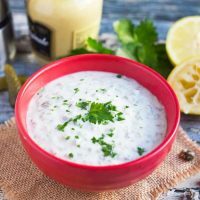 The amount of capers and cornichons in this recipe are what I consider to be the minimum amount you want to add to the yoghurt. As I never really measure these ingredients, I sometimes end up with more than specified. Use more if you wish. However only add the amount of parsley specified below as it will overpower the other flavours. I only make this in small quantities, enough for one meal, so I have no idea if it will keep at all. Place the yoghurt in a small bowl. Add the remainder of the ingredients and stir thoroughly. Taste the sauce. You may need to adjust the seasonings. I like to balance it out with a little extra lemon juice and pepper if required. Serve immediately. This can be made a few hours in advance and stored in the fridge until required. * I use salted capers, and therefore find that I do not normally need to add additional salt. Taste the tartare sauce, and add salt if required.